Today officially ends my catch up and get ahead time in the production cycle. As of today, I have sales every weekend and a gallery to keep up with along with home sales and students. I have lots of Market meetings every month and lots of packing and unpacking for shows and sales. The local art show is happening on the 7th to 10th of April and I will have to get Dave to do one day of the show so that I can go to the Market as it spans a weekend. There is a gift shop this year for the first time and I decided to pay for the four days in the gift shop so that I would be able to sell some work. I have put some items in the "A"rt show in past years and even if a pot sold, the money I got back didn't cover even the raw material costs of the pot after entry fees and commissions etc were taken off. This year the gift shop only folks are not included in the gala opening night as the gift shop will not be available to view at that time. Perhaps that will change next year as it is a bit odd that the giftshop isn't included in the whole event, there is no need to separate things this way. I have been working on a plan of what to throw in the next few days as the early week is best to start projects and then finish them up in the shorter bursts of time that the later week allows. I have added a photo at the top, one of Kurt Knock's lovely pictures of course. 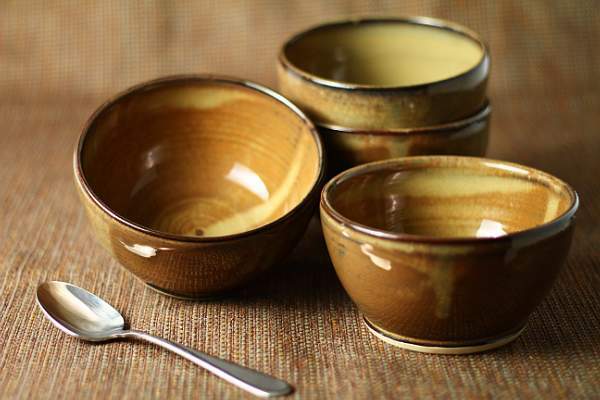 These bowls are in my water glaze and are a larger volume soup bowl set.